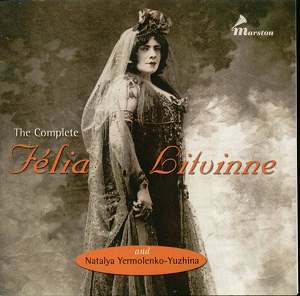 Litvinne was born Fran�oise-Jeanne Sch�tz in St Petersburg in 1860. Her father was Russian, her mother French-Canadian and at the age of fifteen the girl went to Paris to study, eventually taking lessons from the famed Pauline Viardot-Garcia. She made her debut in 1883 and travelled to Brussels, the Paris Opera and back to St Petersburg and Moscow and was invited to La Scala in 1890. A little hiatus after her marriage saw her leave the stage but she soon returned giving Parisian premieres of Wagner (Isolde, Br�nnhilde in G�tterd�mmerung in 1899 and 1902 respectively). And it was as Isolde that she made her Covent Garden premiere, later singing Aida, Gioconda and Donna Anna. Though she was renowned as a Wagnerian she did a lot of work in other repertoire, from Gluck to Saint-Sa�ns, until her operatic retirement in 1917, though she continued to sing in recitals. Thenceforth she became as notable a teacher as she had been a singer, counting Koshetz and Lubin amongst her pupils. Over nine years she recorded for three companies � G&T, Path� Fr�res and Fonotipia/Odeon, in chronological order. They began in approximately late 1902 and ended around 1911 � documentation regarding precise dating has long since disappeared. The discs represented in Marston�s splendid two CD edition contain her known surviving recordings; a handful of others were made but none are known to have survived. One of the pieces here � the Odeon Ich grolle nicht - exists in only one copy, so far as is known. There are twenty-seven operatic items and eight songs, though some naturally suffer from judicious cutting and abridgements. What sort of voice did Litvinne have? Hers was a strong dramatic soprano with a big range and well suited to Wagner. It had a powerful centre but a more strained top and embodied a certain contralto depth. It's not an especially beautiful voice - but then neither does it curdle - and is forcefully projected even in the 1902/03 sessions, with a fine technique. It was, I suppose, a cosmopolitan French sound and less explicitly Gallic than others. Her Massenet, though, is noble and loftily phrased with that mezzo power to the fore. Her Schumann Ich groll nicht is not for everyone. It's a frankly operatic voice barely scaled at all in this or other lied. Nor can the recording cope - there's some blasting - but against the sheer inappropriateness of a voice this big taking on a song of this kind we can still listen to her thrilling chest voice. An exciting, exaggerated, utterly "wrong" performance - but insightful into her way of doing things on the recital platform. I say Ich grolle nicht but as with other performances she re-recorded a lot of her repertoire and there are two recordings of it here. The earliest sessions were made with none other than Alfred Cortot and the later ones with an unidentified pianist. We can test her technique in the coloratura demands of Meyerbeer - full of trills, registral leaps, and divisions - all fine. She has some dicey moments up top in Verdi in a brace of performances that doesn't really show her at her best and her Samson reveals something that contemporary critics didn't seem to comment on - a certain shortage of breath deriving from insufficient breath control. Her Carmen is slightly untidily phrased but the Gramophone Le Cid (Cortot's recordings were always with them not Fonotipia) reveals much the same qualities as her Fonotipia, though in worse sound. Her Isolde is rather compromised by the recording and some technical limitations in the voice but her Gounod Sapho is very accomplished indeed. Her Ho jo to ho is dramatic and fiery if scrunchy at the top of her range - but one can certainly see why she was so admired in Wagner - and we get a surprise in the Cortot-accompanied and earlier Ich grolle nicht This one is much better - phrasing is much more appropriate, she is more measured and less operatically insistent; the voice is better reined in. It's hardly a lieder voice but it shows how changeable interpretation can be.� She was actually a pioneer of m�lodie on disc. Her Faur� comprises a big voiced and rather no-prisoners Les Berceaux and her Hahn might be a discographic first. The surviving Litvinne sides have never been available en masse in this way. Two companies of late however have transferred a large percentage of them � Malibran [MR552] and in Symposium�s Harold Wayne Collection series. Comparison between all three is instructive. The Symposium and Malibran transfers sound largely similar; often rather rough transfers, with commensurately rough starts, unprocessed clicks and often dim sounding. The great advantage of Marston�s work is that he and his collaborators have been able to stabilise the inherent piano instability without any damaging collateral effect on the voice. This is a blight that has afflicted all previous transfers. Marston�s transfers are not always quite as �forward� as Symposium�s but they certainly make for much more sympathetic listening, are better balanced, have removed as far as is possible extraneous intrusions and have got to grips with the fundamental issue of piano instability. They are, in short, very convincing albeit rather more interventionist than is usually the case from Marston, as he acknowledges in a lengthy booklet note. The notes are fulsome about her career and in analysis of her operatic recordings. I was disappointed to note that the writer didn�t extend his analysis to her rare and pioneering song recordings � the apartheid that seems to exists between the operatic and song will be bewildering to non-specialists. Wonderful photographs complete this most desirable acquisition.